Thirteen-year-old Rynn (Jodie Foster) tries to keep her father’s recent death a secret from her nosy landlady (Alexis Smith), her landlady’s lecherous son (Martin Sheen), and a local cop (Mort Shuman). Eventually she enlists the help of an unusual teenage boy with a limp (Scott Jacoby), and the two fall in love. This “uncomfortable but interesting film” deals with one of my favorite cinematic tropes: independent kids who must survive on their own in an adult-centric world. As Peary notes, the movie’s “preposterous storyline” sometimes “overwhelms its unique ‘child liberation’ theme”, but the film nonetheless builds to a genuinely suspenseful conclusion, and “Foster’s terrific performance still comes through.” Despite the fact that she’s killed at least one person and may kill more if necessary, Rynn is a remarkably sympathetic protagonist, and we root for her until the very end. No, but it’s definitely recommended for Jodie Foster fans. Not a must — though Foster does deliver an intelligent performance, often managing to make you forget the clunky aspects of the script. If you’re a Foster fan, you may want to take it in. 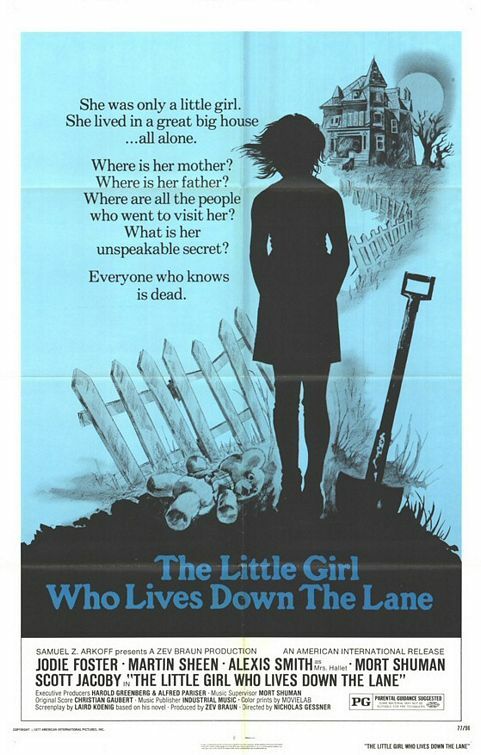 However, “Little Girl…’ has the look and feel of a made-for-tv movie, and a stagey one at that (the bulk of the story takes place inside a house). The plot development is so minimal that, halfway-through, the film becomes tiresome. Sheen — normally a competent actor — seems to be trying too hard; but, again, it’s difficult to blame him, or anyone in the film, considering the script. Jacoby, a mirror image of Matthew Modine, succeeds somewhat. “LG…’ reminded me of the more intriguing “Our Mother’s House’ (1967) — a much better film with a similar premise (on Peary’s “additional’ list, but difficult to find). The year “Little Girl…’ was released also brought Foster in “Freaky Friday’, “Bugsy Malone’ and “Taxi Driver’, so she certainly was busy!